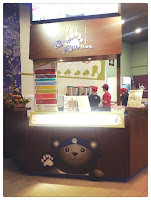 Bear Paw, located at PV128, is a Taiwanese snack restaurant that's been there for quite some time and being a Setapakian, it's quite ashame that I haven't try that before. Since Peiyue is back, so we decided to try Bear Paw as dinner. 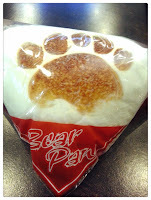 I was fascinated by the bear paw bun, but didn't know anything about it. It's something like burger, but more to oriental style. The bun is actually quite similar to the Chinese mantou, fluffy and soft, me likey. At first the waitress who took our order is kinda not in the mood, but then after a while she's okay again. So basically you will choose from Set 1 - 5, each set got its range of drinks for you to choose. I had Lemon Yakult while Peiyue ordered Lemon Black Tea. 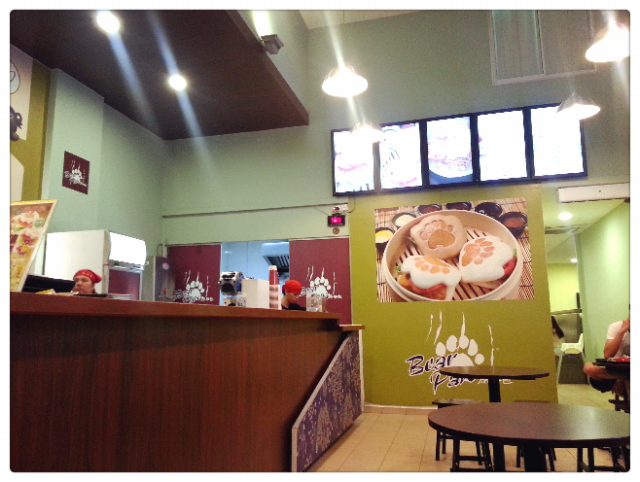 Next, is to decide what flavour of bun you want. I opted for milk which is a bit sweet and Peiyue's wholesome wheat bun tastes just nice. Fillings are either fried chicken fillet, spicy fried chicken fillet, fish fillet or ham and egg. Then choose the dressings, I chose honey mustard, which is a no-no! Teriyaki sauce and some tips left in Foursquare said Thousand Island is good. Maybe I should go and try again their black sugar bun next time with another type of sauce. Overall it's not that bad but not as good as it claims to be, a tad bit overrated to be exact. The only thing that's good is their bun! How I wish that they sell buns only, then probably I will visit them again and again. Lol.